The struggle with electronic health records (EHR) is real, and Congress needs to hear from physicians. But how can you make your story compelling? How can you pen a tale that cuts to the heart of the matter and inspires your members of Congress to take action? These seven elements of storytelling—recommended by an expert on engaging members of Congress—will help you craft the most potent version of your story. In an AMA Very Influential Physicians (VIP) webinar last week, Brad Fitch, president and CEO of the Congressional Management Foundation, delivered expert advice on how physicians can compose and position their personal EHR stories in an effort to persuade Congress to take action against meaningful use Stage 3 and further progression of the program’s troublesome regulations. Why is storytelling important for this cause? Storytelling is a key part of the psychology of persuasion. We feel, and then we decide. In order for Congress to understand the detrimental effect meaningful use regulations have on daily practice, physicians need to deliver a perspective that will show the impact on their lives and the lives of their patients. Members of Congress deal with a lot of data, spreadsheets and graphs every day, Fitch said. This type of information is being delivered to them all the time. But only physicians can communicate the personal stories from the front lines and drive them to act. Mark Twain once said, “I would have written a shorter letter, but I didn’t have the time.” Condensing your story can be difficult, but take the time to make it concise. A shorter story is more memorable and can leave a lasting impression, Fitch said. 1. “The Want”: Begin with the end in mind. Know what you want before you begin. Do you want your member of Congress to understand how EHRs have increased costs to your practice or impacted the delivery of care to patients? A good storyteller begins knowing what the end product should deliver emotionally. Consider various tactics and methods to achieve your goal in the story. Your goal can be to flatter, surprise, or evoke empathy or urgency. You are the Steven Spielberg of your story. What effect do you want to have on your audience? 2. “The Opening”: Set the stage and establish the stakes. Your first sentence or two should make your reader want to know more. What is at stake for patients, their families or you as the physician providing their care? As much as possible, think about the effect these regulations have on your ability to deliver quality care to your patients. 3. “Paint the Picture”: The details and senses of your story. When you experienced the moment you are writing about, what did you see, hear, touch, taste and smell? These are the elements that will get your members of Congress involved in the story. Remember to use adjectives to enhance the power of your narrative. Make it real. Be practical, specific and graphic—don’t hold anything back! What descriptive words could make your story compelling and interesting? For example, substitute “morose” for “sad” or use the word “devastated” rather than “upset.” These are the kinds of impact words that paint the picture of your story. 4. “The Struggle”: Describe the fight. Identify the conflict. Real struggles in life are mental, philosophical, emotional, physical—even internal. Every story has a protagonist and an antagonist, and the interactions between these two is where the conflict lies. Don’t hesitate to play the underdog. Members of Congress love to come to the aid of the underdog. They want to help David win the battle against Goliath. Play that strength. 5. “The Discovery”: Always surprise the legislator. What did you learn or realize in the moment of your story? Find this answer and deliver it when it will have the most impact. Then describe how that learning impacted your life, the lives of your patients, the future of your practice and your ability to deliver quality care. You may not have a discovery, but is there a part of your story that might surprise the legislator? If you can add a twist—a moment that truly delivers the scope of your struggle—then use it. 6. “We Can Win!”: Introduce the potential of success and joy. Success in a story is when the hero or heroine wins the fight or struggle. Joy is when the audience can participate and take part in the celebration of victory. If you can hook your members of Congress into feeling the impact of success and the joy that will follow, they become a part of your cause. Think: “Senator/Representative, we have the opportunity to ….” Then describe how that victory will enhance your practice and the lives of patients and their families. 7. “The Button”: Finish with a hook. As you end your story, come up with a last line your members of Congress will always remember. Be thoughtful when composing your final line. Write it out and make it perfect. Have your ending sentence memorized when you’re speaking in person. This way, your member of Congress will remember it for the rest of the day. Fitch related a particularly salient example. While delivering his story to a Congressman regarding his inability to acquire necessary medication, a veteran described a moment when his granddaughter asked him, “Poppy, why do your hands shake?” He looked at the Congressman and said, “What should I tell her?” This kind of hook will tug at the heart strings of your members of Congress and stay with them. Once your story is drafted, revised and final, deliver it to your member of Congress. Visit breaktheredtape.org to send your story directly to Congress by email. Remember to take your time. A well-crafted story, no matter how small, can hold remarkable power. Become a member of the AMA’s “Very Influential Physicians (VIP)” program by visiting the AMA Grassroots Advocacy Web page to take part in future activities. You also can log in to view the full 7 elements of storytelling webinar. Health insurance companies are sharply limiting the number of physicians and hospitals they include in their networks as a tool to limit how much they have to pay in covered benefits. Narrow networks are booming in plans sold both through employer-sponsored insurance and on the Affordable Care Act (ACA) marketplace exchanges. These moves leave patients out in the cold, and squeezed for the costs of health care the plans aren’t covering. The popular news media and scientific literature have been filled with stories lately about narrow networks. Here’s a roundup. Rheumatologists, endocrinologists, and psychiatrists were the specialists most often missing from the plans. Texas has more “x-small” networks (45 percent) on the ACA exchange than any other state in the network. That’s what the Leonard Davis Institute of Health Economics (LDI) at the University of Pennsylvania found. (“State Variation in Narrow Networks on the ACA Marketplaces,” published by the Robert Wood Johnson Foundation, August 2015.) Those super-shrunken networks offer access to 10 percent or fewer of the physicians in a rating area. This study looked at plans issued by 267 carriers across 355 networks in all 50 states. It used “t-shirt size” ratings of x-small (less than 10 percent), small (10 percent-25 percent), medium (25 percent-40 percent), large (40 percent-60 percent), and x-large (more than 60 percent). The variation was extensive. Some states, such as Delaware, Kansas, and North Dakota, have mostly large or x-large networks. Others don’t at all. In an earlier study, the authors at the Davis Institute found that 41 percent of silver plans on the ACA exchanges were x-small or small. “Across the country, close to half of the 2015 networks that consumers can choose from are narrowed; in the largest cities, almost two-thirds of the networks are narrowed,” the report states. The report defines a “narrow” network as having 70 percent or fewer of local hospitals participating. An “ultra-narrow” network has 30 percent or fewer participating. 73 percent of the doctors see more Medicaid patients because insurance companies don’t provide enough primary care or specialty physicians for their patients. 65 percent see more patients in the emergency department, in large part because health insurance companies don’t provide enough primary care physicians to support the community. 60 percent have difficulty finding specialists for their patients, because of narrow networks. More than 80 percent treat patients who said they had difficulty finding specialists to care for them because health plans have narrow networks. This so-called report is nothing more than a desperate smoke screen to divert attention from the real problem. The health insurance industry games the system to keep more of patients’ premium dollars by forcing patients to seek care out of network. Then they have the gall to criticize what some doctors’ bill for that care. And the San Antonio Express-News published a response to the study from William W. Hinchey, MD. A TMA study examines how insurance plans’ network designs and payment decisions leave many Texans with “surprise bills” for health care services. Inadequate and limited physician networks that insurers sell today are leaving patients with unpaid bills. Unfortunately, Texas consumers are learning the limits of the coverage they bought just when most need coverage, especially in emergencies. The consumer is no longer satisfied with the not-very-well-explained, varying levels of savings that insurance networks create, especially if that means a greater financial burden in emergencies. Yet, despite network shortcomings, consumers do not want to be left without the choice of plans that offer network benefits. What Exactly IS Wrong With EHRs? Many thanks to David Fleeger, MD, of Austin, a member of the TMA Board of Trustees, for taking the time to explain electronic health records and Meaningful Use on this TV show. He even managed to work in "Meaningless Use." Looking for a road map to arrive at a stronger social media presence? This month, we’re offering help to get you more social savvy. 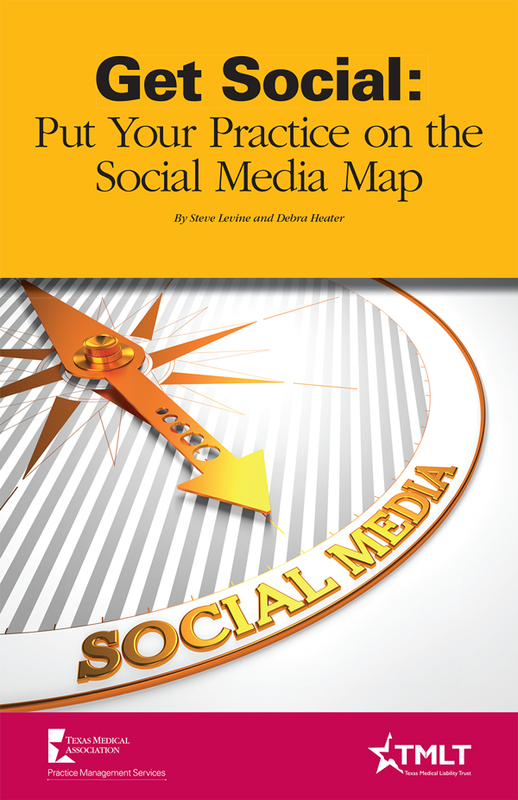 During October, visit the TMA Education Center to download a free excerpt of Get Social: Put Your Practice on the Social Media Map by TMA’s Steve Levine and Debra Heater. Get Social explains how to use popular social media sites like Twitter, Facebook, YouTube, and others. The book offers handy tools and insights for physicians, medical students, and office staff interested in engaging with patients, and the public, on these platforms. You’ll also find advice and best practices for using social media responsibly and avoiding potential HIPAA pitfalls. Download your free excerpt. The free excerpt will be available through Oct. 31. (CHICAGO) – Following up on yesterday’s story (ICD-10: Stop This Freight Train ... Or At Least Install Seat Belts! ), we can report that the American Medical Association House of Delegates today unanimously adopted the Texas-backed proposal to ask the federal government to adopt a two-year, penalty-free grace period following the expected Oct. 1 mandatory implementation of the new ICD-10 coding system. If a delay of ICD-10 implementation is not feasible, that our American Medical Association ask the Centers for Medicare & Medicaid Services (CMS) and other payers to allow a two-year grace period for ICD-10 transition, during which physicians will not be penalized for errors, mistakes, and/or malfunctions of the system. Physician payments will also not be withheld based on ICD-10 coding mistakes, providing for a true transition where physicians and their offices can work with ICD-10 over a period of time and not be penalized. That our AMA educate physicians of their contractual obligations under Medicare and insurance company contracts should they decide to not implement ICD-10 and opt to transition to cash-only practices which do not accept insurance. That our AMA aggressively promote this new implementation compromise to Congress and CMS since it will allow implementation of ICD-10 as planned, and at the same time protect patients’ access to care and physicians’ practices. That our AMA provide the needed resources to accomplish this new compromise ICD-10 implementation and make it a priority. That our AMA seek data on how ICD-10 implementation has affected patients and changed physician practice patterns, such as physician retirement, leaving private practice for academic settings, and moving to all-cash practices and that, if appropriate, our AMA release this information to the public. ICD-10: Stop This Freight Train ... Or At Least Install Seat Belts! 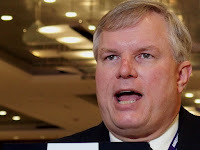 (CHICAGO) -- Staring down the muzzle of the Oct. 1 mandatory deadline to implement the ICD-10 coding system, the American Medical Association House of Delegates searched for multiple ways to help U.S. physicians dodge a dangerous bullet. Thanks to strong lobbying from AMA, the Texas Medical Association, and other physician groups, the original Oct. 1, 2013, ICD-10 deadline has been pushed back twice. Both TMA and AMA still formally oppose ICD-10. They've pointed out that many physicians, especially those in small practices, are still not ready to use the new coding language. Some cite the high cost of transition; others blame electronic health record vendors that have not yet made ICD-10-compliant software available. Those who aren't ready run the risk of having all or some of their Medicare, Medicaid, and commercial insurance claims going unpaid. TMA supports H.R. 2126, the Cutting Costly Codes Act of 2015, by U.S. Rep. Ted Poe (R-Humble), which would prohibit the government from requiring physicians and health care providers to use ICD-10. Texas physicians at the AMA meeting spoke out about the dangers they foresee, especially for primary care practices. Greg Fuller, MD, a family physician from Keller, said the wide array of medical problems primary care physicians treat is forcing them to try to learn thousands of new codes. "We need to stop ICD-10," Dr. Fuller told the Reference Committee on Legislation. 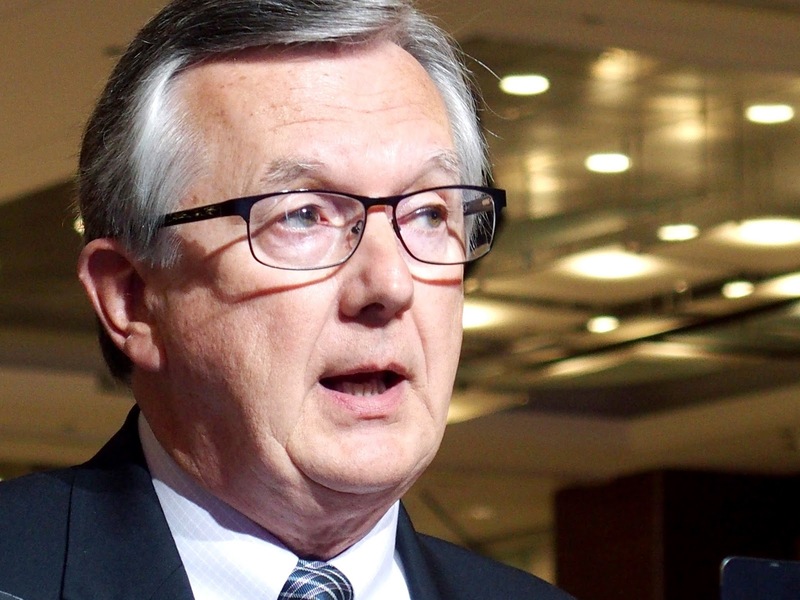 "Any delay in pay is going to kill these practices." E. Linda Villarreal, MD, an internist in the Rio Grande Valley, said she is concerned about the ramifications for access to care in South Texas, many parts of which already face a dire shortage of physicians. "I've taken three courses in ICD-10, and I still don't get it," Dr. Villarreal said. But Washington watchers say Congress has no stomach for delaying the implementation date one more time. "The ICD-10 Coalition has done a better job than [medicine has] over the past four years," one delegate said. That leaves organized medicine in a tough spot, said Fort Worth pediatrician Gary Floyd, MD, a member of the TMA Board of Trustees. Groups like AMA and TMA must continue to push for a last-minute reprieve and at the same time work to protect their members from the likely upheaval that will come with ICD-10, he explained. "Our message is this," Dr. Floyd said, "don't give up the ship, but make sure the lifeboats are manned and at the ready." One likely outcome of the House of Delegates meeting will be a directive for AMA to push the Centers for Medicare & Medicaid Services (CMS) for some leeway for physicians who can't master the intricacies of ICD-10 right away. "We simply need to implement ICD-10 as planned and ask for a grace period where we are not held financially accountable for improper coding in order to protect our patients access to care and to protect physicians’ practices," said Alabama urologist Jeff Terry, MD, who has been an outspoken critic of ICD-10 for the past several years. He said a bill introduced last week in Congress by U.S. Rep. Gary Palmer (R-Alabama) would set up such a grace period. Acceptance of ICD-10 codes with less-than-optimal degrees of specificity. The reference committee's recommendations are expected early Monday, and the full House of Delegates will debate the issues before the meeting ends on Wednesday. TMA offers extensive ICD-10 coding training materials, including specialty-specific online ICD-10 documentation training, on-demand webinars, and customized on-site ICD-10 training. (CHICAGO) -- With an uncontested race, the outcome was all but certain ... but the celebration was real. After a four-year stint in the No. 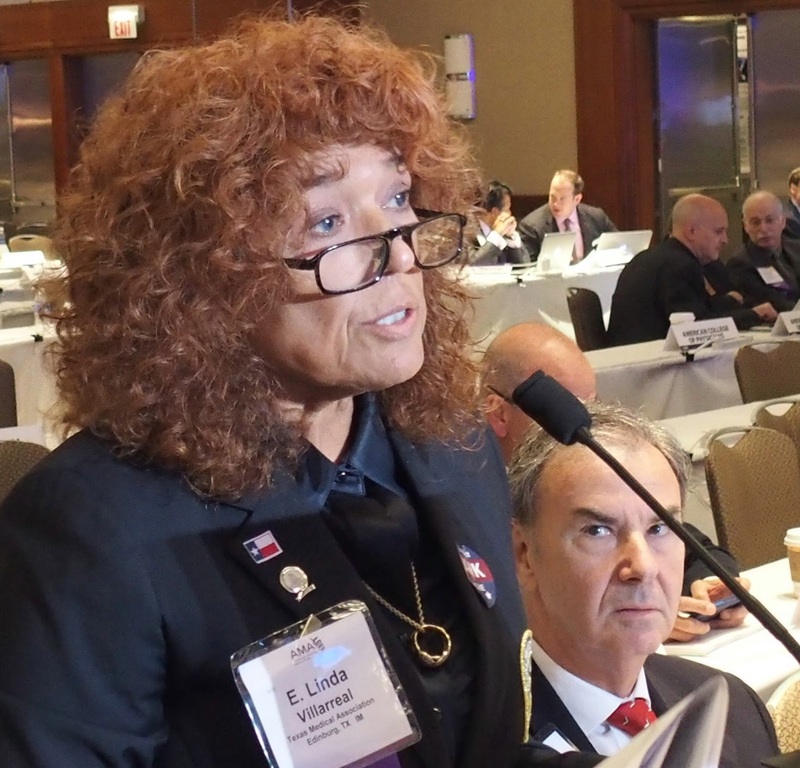 2 spot, Fort Worth allergist Sue Bailey, MD, today won election as speaker of the American Medical Association House of Delegates. She moved up one notch after the current speaker -- Andy Gurman, MD, of Pennsylvania, was chosen AMA president-elect. "I love this house, and I love this organization," Dr. Bailey said after the delegates elected her by acclamation. "I look forward to continuing our robust work to improve the health of our nation together." David Henkes, MD, of San Antonio, chair of the Texas Delegation to the AMA, placed Dr. Bailey's name in nomination. "Sue Bailey is a good person, a nice person, a wise person, and a wonderful mentor," Dr. Henkes said. "I guarantee you, the physicians of Texas would follow wherever she leads – and this house would be well-advised to do the same." Dr. Bailey has a long history of service to organized medicine, beginning with her stints as chair of the medical student sections of both the Texas Medical Association and the AMA. She chaired the TMA Council on Communication and served as speaker of the TMA House of Delegates before winning election as TMA's 145th president in 2010. She also was president of the Tarrant County Medical Society. 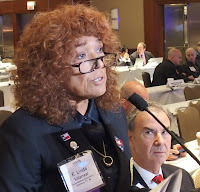 At the AMA, she has served as chair of the Texas Delegation, as a member and chair of the AMA Council on Medical Education, and as the AMA representative on the board of the Accreditation Council for Continuing Medical Education. She has served as vice speaker of the AMA House of Delegates since 2011. Dr. Bailey is an allergist in private practice at Fort Worth Allergy and Asthma Associates. She previously served as an associate consultant at the Mayo Clinic's department of pediatrics in Rochester, Minn. She is board certified in allergy, and immunology, and pediatrics. Dr. Bailey received her medical degree from Texas A&M Health Science Center College of Medicine and later served on the A&M Board of Regents. She completed her residency in general pediatrics and her fellowship in allergy/immunology at Minnesota's Mayo Graduate School of Medicine. This article was originally published in Digitized Medicine on May 18, 2015. Reprinted with permission. Texas Representative Ted Poe has introduced H.R. 2126, the Cutting Costly Codes Act of 2015. This legislation would prohibit the federal government from requiring physician offices to comply with the proposed transition to ICD-10 codes. 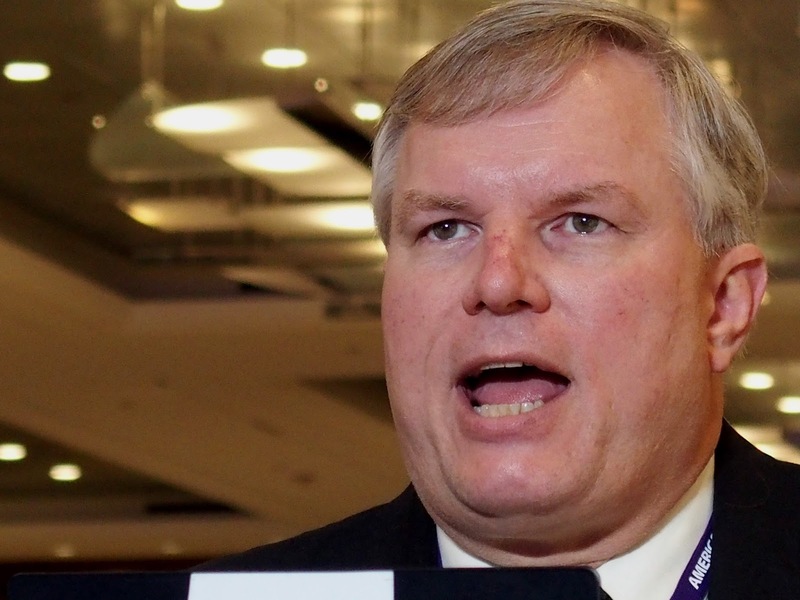 “The new ICD-10 codes will not make one patient healthier," Representative Poe said. 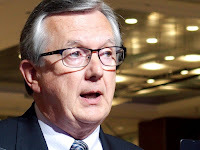 "What it will do is put an unnecessary strain on the medical community who should be focused on treating patients, not implementing a whole new bureaucratic language.” He has clearly listened to the Texas Medical Association (TMA) which has consistently advocated for postponement of ICD-10 on behalf of 48,000 physician members. I am one of those Texas physicians who is thankful that a congressman has listened to us. If this bill were passed it would postpone ICD-10 and call for the GAO to study the issue, but it does not propose any solutions. Although I am in favor of this bill, I agree with the cry of many healthcare stakeholders that we need a solution to move away from the antiquated ICD-9 codes. It seems likely that a bill that does not propose an alternative solution will have difficulty getting passed. I am hopeful, though, that debate about this bill might illuminate two major flaws in national health IT strategic planning. The current ICD-X strategy which includes no roadmap to ICD-11 will set up the U.S. healthcare industry for strife and conflict in the 2020s when we see the rest of the world leveraging integration between ICD-11 and SNOMED to improve quality of care and control costs while we struggle to gain value from what will then be an antiquated ICD-10 coding system. The first flaw is the lack of a strategic plan or roadmap at a national level for ICD-X conversions. For example, there is no mention of ICD-10 or ICD-11 planning in ONC's federal health IT strategic plan 2015-2020. It is difficult to trust a strategic plan that fails to account for the tremendous burden that an ICD-10 and/or ICD-11 conversion brings to the healthcare industry. The ICD-10 tactical delays can be directly attributed to conflicting strategic national healthcare priorities which resulted in an overlap of initiatives at the local level, such as the Meaningful Use Program and e-prescribing requirements, and created unreasonable, concurrent burdens on physicians. Tactical delays like this can be avoided through more effective strategic planning at the national level. It is particularly disconcerting that there is no national roadmap to ICD-11. As I previously wrote, the U.S. is planning to achieve a short-term tactical goal of replacing antiquated ICD-9 codes while the rest of the world is closing in on their long-term strategic goal of implementing ICD-11. Informatics experts are in agreement that ICD-11 is superior to ICD-10 and is much more integrated with SNOMED codes. Unless we develop a long-term ICD-11 strategy, we are destined to be in the same predicament in the 2020s when we will be struggling with a tactical goal to get off of last century’s ICD-10 with no roadmap in place to align that effort with other healthcare priorities. The second flaw is the lack of an effective process during ICD-X conversion planning to identify and address the concerns of grass root physicians who see patients every day. Failing to address physician concerns prior to developing the ICD-10 solution to the replacement of ICD-9 was a strategic blunder. Perhaps the most significant physician concern is the tremendous burden placed on physician practices by the ICD-10 conversion. Optimal planning on how to replace antiquated ICD-9 codes really should include discussions on how we might best reduce or avoid that burden. At the very least, we should discuss how best to reduce that burden in the future, because physicians see ICD-11 coming around the corner. For example, we should discuss the possibility of converting from use of ICD-9 or ICD-10 to use of SNOMED codes in physician practices. Physicians would not have to learn new ICD-X codes each time administrators decide a conversion is necessary. Use of SNOMED codes mapped to ICD-X codes would be less disruptive to physician work flow and be more cost effective for physician practices as compared to complying with future ICD-X conversion mandates. The analysis on how best to resolve the ICD-9 problem should address physician concerns and result in a strategic plan that is determined to have the highest potential to improve healthcare quality at the lowest cost. So what are some attributes of the optimal strategic planning effort? It would be included in ONC's federal health IT strategic plan. It would include a national roadmap to ICD-11. It would include a comparative analysis of the cost/benefits of completing a conversion of ICD-10 versus a direct conversion from ICD-9 to ICD-11. It would include an analysis of the potential to replace ICD-9 or ICD-10 codes in physician practices with SNOMED codes. And it would include a process to identify and address the concerns of physician practices throughout the planning stages. “On behalf of our 48,000-plus physician and medical student members — and the patients we serve — the Texas Medical Association strongly endorses HR 1470, the SGR Repeal and Medicare Provider Payment Modernization Act of 2015, to repeal and replace Medicare’s Sustainable Growth Rate (SGR) formula,” TMA President Austin I. King, MD, said today. Texas physicians, of course, are applauding the news reports that a bipartisan plan to repeal Medicare’s Sustainable Growth Rate (SGR) formula is picking up steam. Physicians are tired of the never-ending uncertainty, the never-ending threats to cut Medicare pay, the never-ending need to lobby Congress on the same, never-ending problem. Our patients are tired of the never-ending fear of losing their doctor. Eighteen years and 17 patches is enough. If history is any guide, the current threatened Medicare pay cut – 22.4 percent scheduled to take effect April 1 – won’t take effect. Congress will either finally repeal the SGR, or they’ll put yet another last-minute patch on it, perhaps with some retroactive shenanigans that will wreak havoc with our cash flow and our bookkeeping. 1. The SGR is a failed attempt at government price control. The SGR has never held down the cost of providing health care to patients on Medicare and TRICARE. Government-imposed price controls don’t work. As conservatives know, price controls distort the free market; in this case they’ve simply forced physicians to find creative ways to bill Medicare for the services their patients need. 2. The “cost” of repealing the SGR is fake. 3. The SGR hides the true cost of Medicare. 4. The SGR repeal bill makes important and significant changes in Medicare financing. The package does more than eliminate the SGR; it profoundly reforms how Medicare pays physicians for health care services. The Journal describes it as “a reform to reward doctors for providing more valuable care, rather than cutting the same fee-for-service check regardless of performance.” That will keep taxpayers healthier in more ways than one. Secondly, the plan pays for some of the cost of repealing the SGR with changes in Medicare premiums and Medigap coverage for the wealthiest retirees. Long-term, those are some huge savings. The American Action Forum research puts the 20-year savings at $295 billion. 5. The SGR stands in the way of real health care reforms. The constant patches and negotiations over the “doc fix” bills distract Congress from the significant structural reforms conservatives want. Let’s not let fake government accounting get in the way. Wall Street Journal: Bouncing the ‘Doc Fix’ -- Faux fiscal hawks may scuttle modest but real entitlement reform.